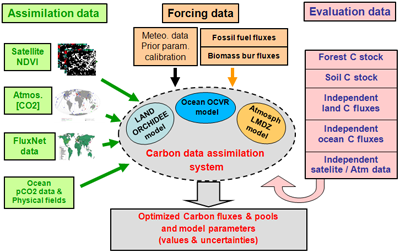 ORCHIDEE Data Assimilation Systems were designed at IPSL/LSCE in order to optimise the carbon, hydrology and energy-related parameters of the ORCHIDEE Land Surface Model, using various data sources (e.g. in situ flux measurements, satellite products, atmospheric CO2 measurements, carbon inventory data, etc.). taking into account uncertainty of both components in a statistically robust framework. In this way, we combine our current understanding of the system (models) with the most up-to-date, detailed process information (observations), in order to provide the best estimate of the variables being studied. Given this information, the ORCHIDEE Data Assimilation Systems allow the derivation of optimized posterior model parameter values and uncertainties. These uncertainties can be propagated through to any model state variable. Following different numerical approaches, few systems were designed to improve model simulations of past, current and future terrestrial energy, hydrological and carbon budgets. The optimised ORCHIDEE model will ultimately be used to diagnose the response of the terrestrial biosphere to climate, management and land use changes. Laboratoire des Sciences du Climat et de l'Environnement (LSCE) is a part of Institut Pierre Simon Laplace (IPSL) as a mixed unit between Centre national de la recherche scientifique (CNRS), Commissariat à l'energie atomique et aux energies alternatives (CEA) and Université de Versailles Saint-Quentin-en-Yvelines (UVSQ).